1> Open a page in VE. 3>Select to add a media file. 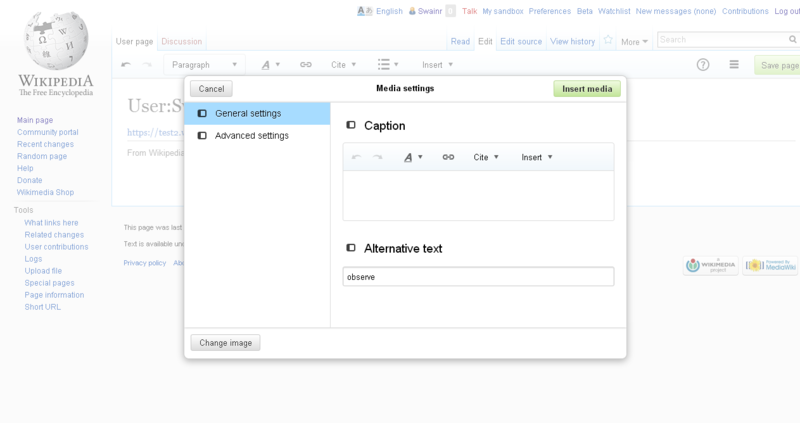 Opens the Media Settings dialog. 4>Now click on “Alternative Text”. This should make the “Caption” inaccessible, but it is not. See screenshot. Now click on Caption pane, and then into Alternative Text, this makes the toolbar in the Caption pane blurred. bzimport set Reference to bz68806. This is a little more complicated than that, though. An image could absolutely have both a caption and an alternate text, and a caption can "act" like alternate text in case of inline images. More to the point, a block image can have both a caption under the image and an alternative text ("title" popup). An inline image doesn't have a functional caption - but the caption serves as its alternate text unless an alternate text overrides it. In short, we need to figure out a consistent way of how to handle caption and alt text in images in general. Just disabling the caption in case of alternate text is not really representative of what is allowed under all cases. Okay, I seem to have misunderstood the bug, sorry about that; I thought you were talking about the entire caption field, not just the toolbar. I'll take care of this. Thank you for the report! Issue Resolved in test2 and beta.